Caithness FM's Annual Christmas Gift Appeal received a major donation from Dounreay. Two thousand pounds worth of toys were donated from UKAEA, AMEC, CH2MHill and Dounreay Employees Charity Fund with all toys being donated by local toy shop ALACAM. All gifts received through this appeal are distributed to children and teenagers in the county. Representatives from each company presented the toys to Caithness FM. Thurso had a busy day with the town centre thronging with shoppers for the Christmas Fun day. Shop staff were dressed up in a variety of costumes and Caithness FM played music over the whole day blasting bubbles into the air from their mobile station. Santa's grotto was kept busy and the weather stayed dry and chilly. Several shops had 10% off everything as special attraction and it seemed to have gone down well as shoppers crowded in. The Caithness and Sutherland Children's Choir received many rounds of applause from shoppers at Tesco, wick on Saturday for their renditions of carols and Christmas songs. 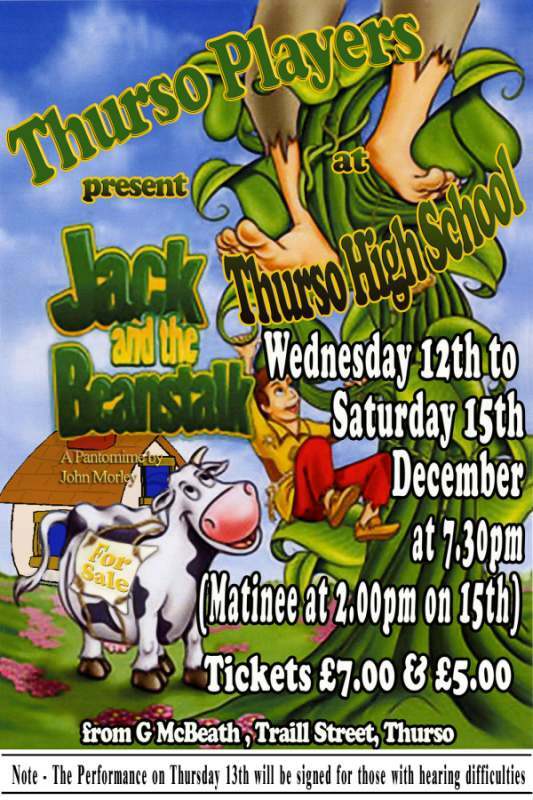 Thurso Players invite you to come along and meet the 'Trotts' at their annual Christmas Panto at Thurso High School. This year's production, Jack & the Beanstalk starts its run at 7.30pm on Wednesday 12th December and will be on, at the same time, each evening up to and including Saturday 15th December. As in the past, there will be a Matinee performance for younger children at 2.00pm on Saturday and a signed performance for the hard of hearing on Thursday 13th. From the police station to the Market Square led by the Salvation Army to the square with carol singing round the Christmas Tree. Prizes for the best dressed children and shop window. Mey Selections, the brand inspired by HRH The Prince Charles, Duke of Rothesay and created by a group of farmers in the North Highlands of Scotland, has launched a range of luxury hampers on its new website Mey Selections in time for Christmas. They are available for all to purchase from selected retail outlets or by telephone. Mey Selections Luxury Hampers will be available all year, but if they are required in time for Christmas 2007, orders should be placed by Wednesday 19th December 2007 to avoid disappointment. Get your tickets at Poltney news, Dempster Street.